My first experience with Buffalo wings was, fittingly, at the Anchor Bar in Buffalo, New York. Alright, more specifically it was takeout from the Anchor Bar in college so that all of us could drink beer in our hotel. It was a trip for an academic competition (yes, nerd) and we could think of no better way to enjoy our time in the wing capital of America. 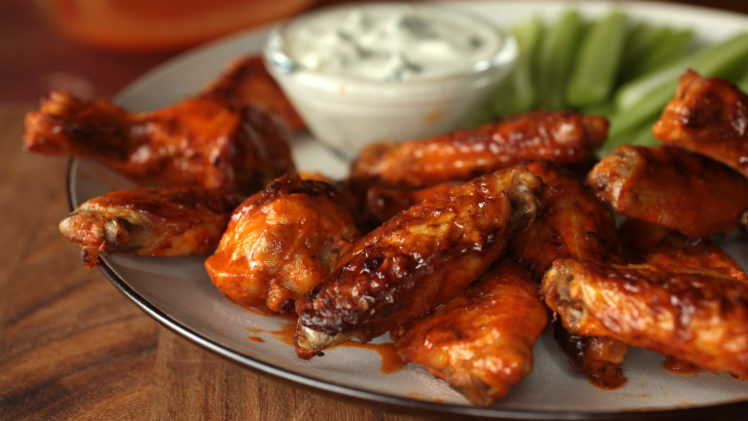 At the time I was a vegetarian but we had several dozen wings in a small hotel room and by the time we’d finished, I had practically absorbed the Buffalo sauce through my pores. At the end of the night, the guys on our trip took all the wing bones, put them in an ice chest, and hid them in the girls’ hotel room underneath the heater. We woke up to a room that stank of Frank’s Red Hot so strongly that it was in our clothes all day at the competition. After something like that, it’s kind of amazing that I still like wings. But I do; I love the vinegary smell of real Buffalo sauce and as a now ex-vegetarian, I can really get into an order of wings. The thing is, I don’t often find myself ordering them and I certainly didn’t make them at home until recently. Wings are generally fried and I don’t like to deep fry at home. I don’t like the mess it makes all over the stove or the smoke it causes from all the little brown bits left in the oil or the smell that it leaves in the house for days after. The solution – baked wings, a process that takes time but not a whole lot of effort. Don’t get the idea that baked wings are the “healthy alternative” – they’re not. 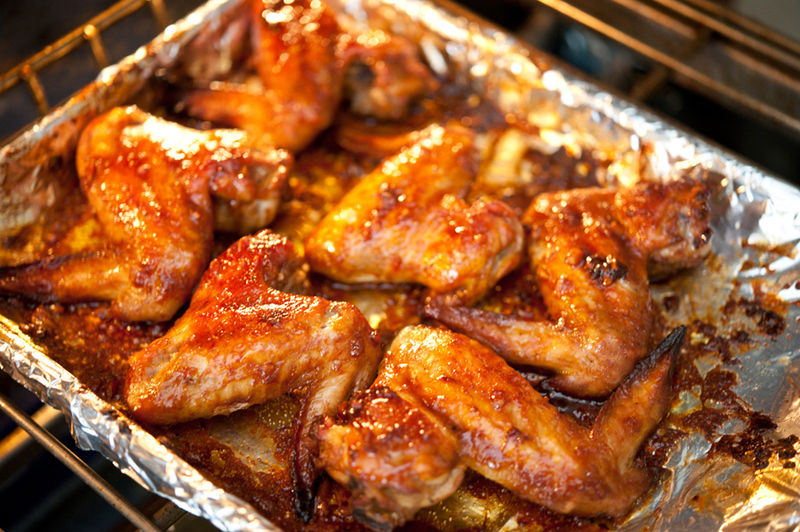 Perhaps they aren’t cooked in fat but wings are more fat than chicken, often sauced in fat, and then dipped in fat. The real benefit of these wings is that they are far less messy than the conventional fried version. The whole recipe can be prepared using a bowl and a sheet pan with a rack – and the rack can be moved directly from fridge to oven when you’re ready for baking. This final result is all the things that a good wing should be: browned all over with a bubbly exterior perfect for catching sauce. The wings are crisp on the outside, so much so that they stay crunchy even under heavy saucing. The baking powder provides extra browning power, the corn starch adds crispness to the finished product, and the seasoned raw wings sit on a rack in the fridge overnight to thoroughly dry – dry skin at the beginning of cooking means crispier skin at the end of cooking. 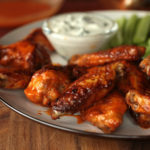 The initial seasoning makes these wings delicious all by themselves, but with some real Buffalo sauce (one part Frank’s red hot, one part butter) and bleu cheese dip – they’re pretty much irresistible. 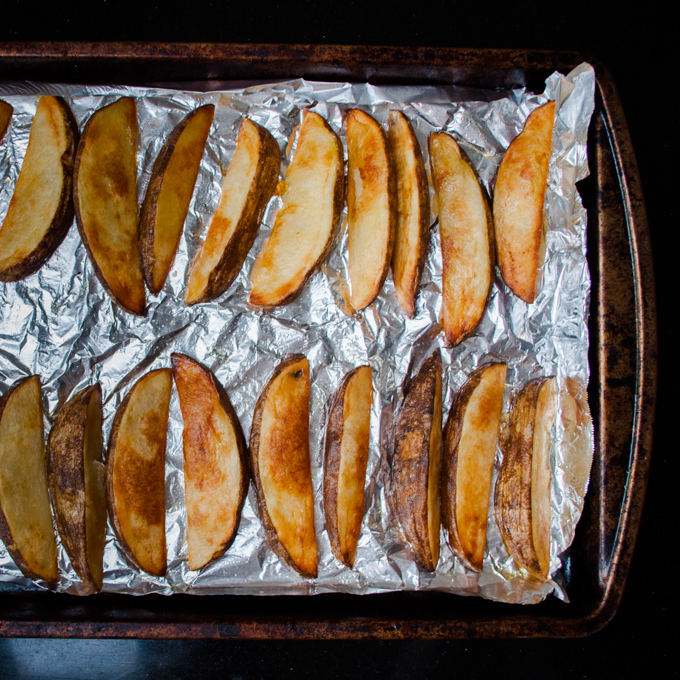 Prepare a sheet pan by lining it with foil and place a baking rack on the pan. This will allow you to move the wings directly from the fridge to the oven when you bake them. Divide the wings in half and work in two batches. Pat each wing dry using cloth or paper towels and place in a large bowl, big enough for tossing the wings with the seasoning. Add 1 tsp baking powder, 2 tsp kosher salt, and 1 tbs corn starch. Toss thoroughly so each wing is coated and there are no leftover dry ingredients in the bowl. Place the wings on the baking rack making sure that there is space between them. Repeat with the second batch. Preheat the oven to 450F and take the wings out of the fridge to take off some of the chill. Once the oven is at temperature, bake them for 20 minutes, flip the wings, and bake for another 20 minutes. Serve plain or toss immediately in sauce and serve. I had to make a last minute extra batch that only got 4 hours in the fridge before cooking. They were indistinguishable from the batch that hung out overnight. On Friday night we sat on the living room floor and played video games. We left the dishes unwashed and the laundry unfolded. We didn’t tidy up. Instead we rummaged through a box of random cords and wires to find the game controller that would let us play Super Mario Bros 3. Several hours were spent trying (and failing) to rescue the Princess, stomping goombas (or getting stomped), enjoying side-scrolling graphics. Dinner was also served on the floor, out of one big bowl, a salad version of a roast beef sandwich that we oohed and aahed over. Let me repeat that: our night of video games included salad for dinner and we were excited about it. This wasn’t a sort of nod to acting like adults while we spent the evening playing Super Mario. The salad was the reward for winning a level and the consolation after someone (cough *me* cough) failed to make a jump for the umpteenth time. It wasn’t a wimpy mix of greens with some dressing and a few pieces of tomato. This was a dinner salad, the real thing, a meal you could eat and still be full a few hours later. Did I mention this is the salad equivalent of a roast beef sandwich? I suppose now you might be wondering why there needs to be a salad equivalent of a sandwich. Well… brace yourself. I’m not really a fan of homemade sandwiches. Cue the disbelief and shocked expressions. It’s not that I dislike sandwiches as a genre. I just find that often sandwiches, especially ones you make yourself to take to work for lunch, are often, lacking. It’s the bread. Sandwich bread is just not that good. Unless you make it yourself, in which case it’s probably excellent. But sliced bread is generally not that great, either dull and flavorless or stale by the time you open your lunch. This is still all the things that are good about a roast beef sandwich just without the sandwich part. 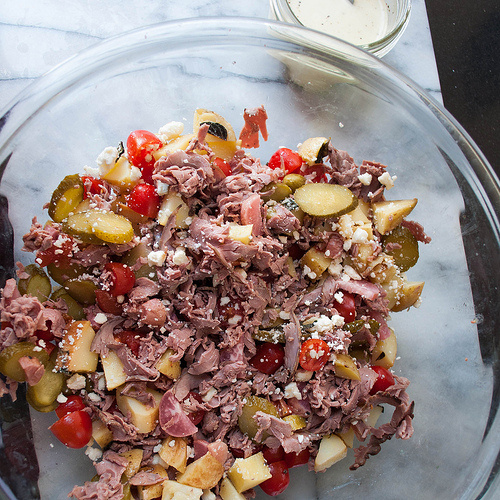 It’s juicy roast beef and tangy pickles and creamy horseradish dressing. And then also some lettuce and whatever vegetables happen to be around and maybe some feta cheese that would otherwise go bad. We polished off the salad in between rounds of jumping on koopas and spitting out fireballs. When there wasn’t enough to get on a fork we picked at it with our fingers and commented on how good it was. It was the kind of perfect that you only get at the end of an ordinary day. Just us, a video game, and this salad. 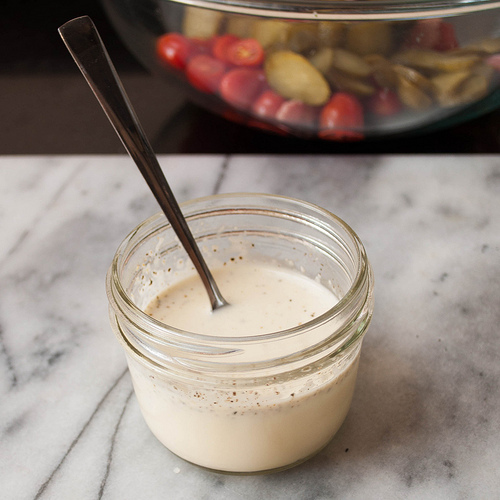 Combine the mayo, oil, and horseradish in a small bowl. The longer you let it sit, the stronger the horseradish flavor. You should let it sit at least 20 minutes, at least while you prepare the other ingredients so that the flavors can meld. Tear or chop the lettuce into pieces and then combine it with the rest of the ingredients besides the dressing. 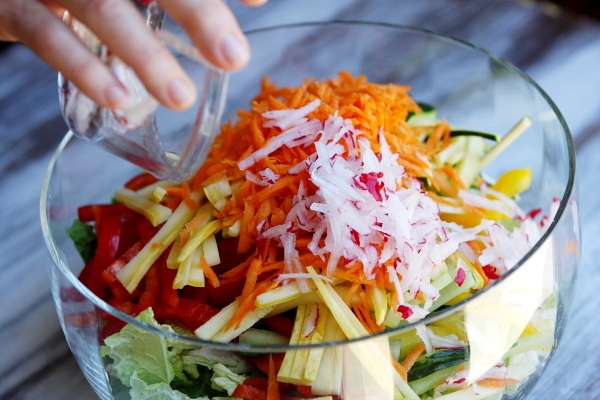 Season the salad with a little salt and pepper and then dress it to your liking. Serve immediately or the greens will wilt – if you want to serve it later leave the dressing off until it’s time to eat. To make this I generally buy deli roast beef and if you cut roast beef slices with a knife the pieces are a bit too regular and the texture is a bit weird. You could also roast some meat and use the leftovers in which case, well done you. When we went on vacation to Hawaii last month my goal was to eat as much pineapple as possible, and I worked hard to achieve that goal. I had pineapple cocktails (including one served in a hollowed out pineapple) and tried pineapple snacks everywhere we went. There was pineapple for breakfast, and for snacks, and sometimes I ordered menu items just because there was some pineapple on the side. At the farmer’s market we got a white pineapple and at the regular market we got a few yellow pineapple and I did my fair share of damage to all of them. I even convinced Jeff to buy two pineapples to bring home – it didn’t take much convincing. On one night of our vacation, we stopped at a local chain, Puka Dog, for dinner because I’d heard they had pineapple relish on their hot dogs. If you haven’t had a Hawaiian hot dog before, it’s a fun little feat of engineering. 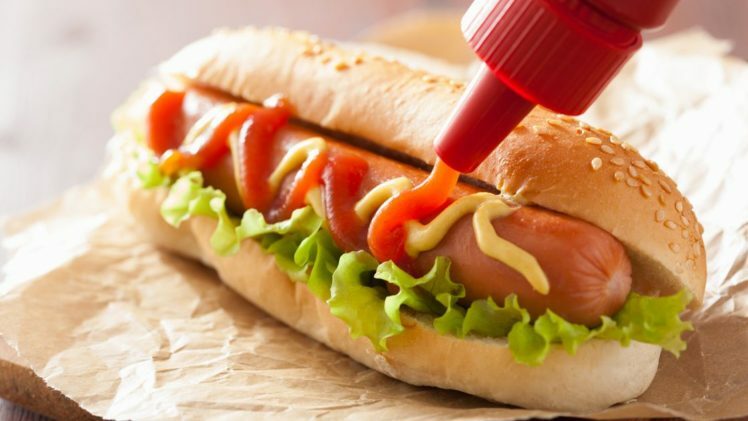 The dogs were delivered inside the bun – no, not sitting on top of a split bun but tucked into a hollowed out hole – and that cored out space had been toasted before the hot dog and its toppings were tucked in. The construction was honestly the most exciting part, since the dogs were somewhat underwhelming – too much bread, not enough pineapple. 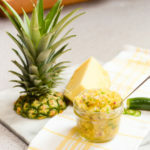 But the pineapple relish was tasty – sweet and a bit spicy. And it gave me the idea for a Hawaiian-themed hot dog to serve at our birthday party, one with more pineapple and some spicy mustard to go with it. 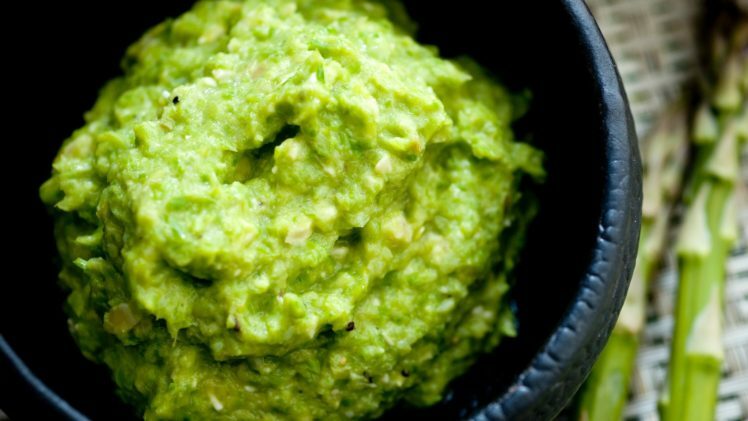 This is somewhere between a salsa and a relish, fresh and spicy but without the characteristic flavor of cilantro that appears in just about every salsa recipe. The omission was originally a mistake – I forgot to pick up cilantro at the store – but the result was so good I decided to keep it. 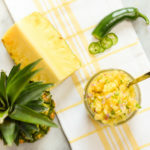 Without the cilantro, the pineapple sweetness and onion sharpness stand out more clearly. This isn’t the first fruit salsa I’ve become obsessed with, there’s the one at the tacqueria down the street and the summer I spent making a cantelope version. And this one seems like it will be the theme of this summer. Sweet and spicy, and just as good on a hot dog as it is on a chip. 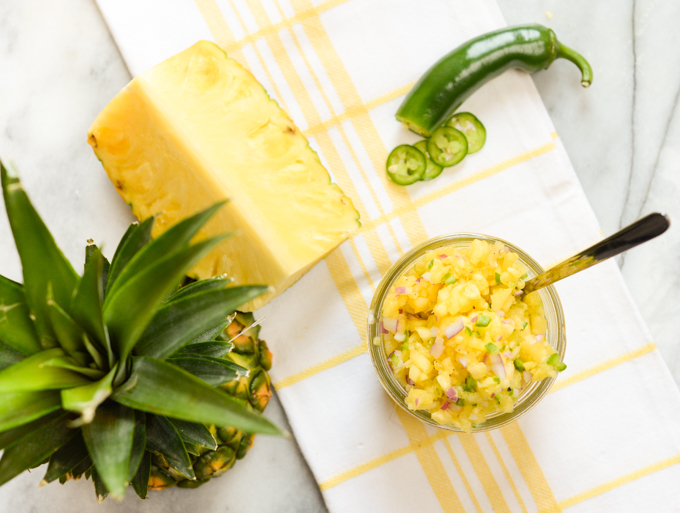 COMBINE the diced pineapple, pepper, and onion in a large bowl and season with lime juice, salt and pepper to taste. Let the salsa sit for at least 20 minutes before serving, to allow the flavors to meld. 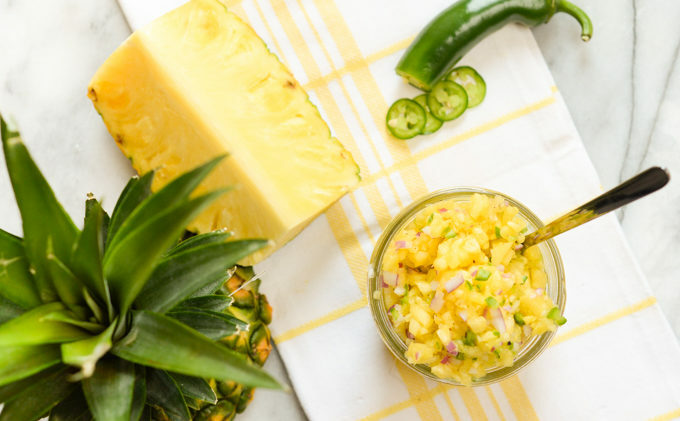 Pineapple is particularly juicy so this salsa gives off a lot of liquid as it sits. You can always strain off some liquid before serving it, or just leave it as is. Always taste your jalapeno before determining how much to add (and how many seeds to throw in). Slice off the end and try it to see how spicy it is, because no two jalapenos are the same. 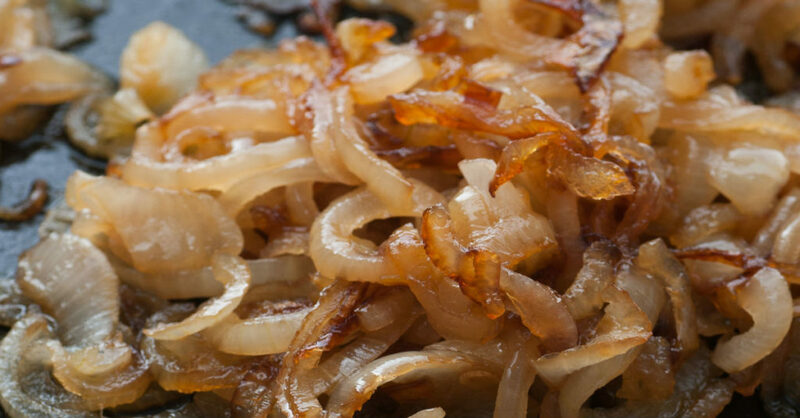 When it comes to time-consuming dishes, caramelized onions are pretty high up there on the list. Not only do they take a long time, they require a lot of attention while you do it. A batch for French onion soup can take several hours and that’s just the beginning of the dish. 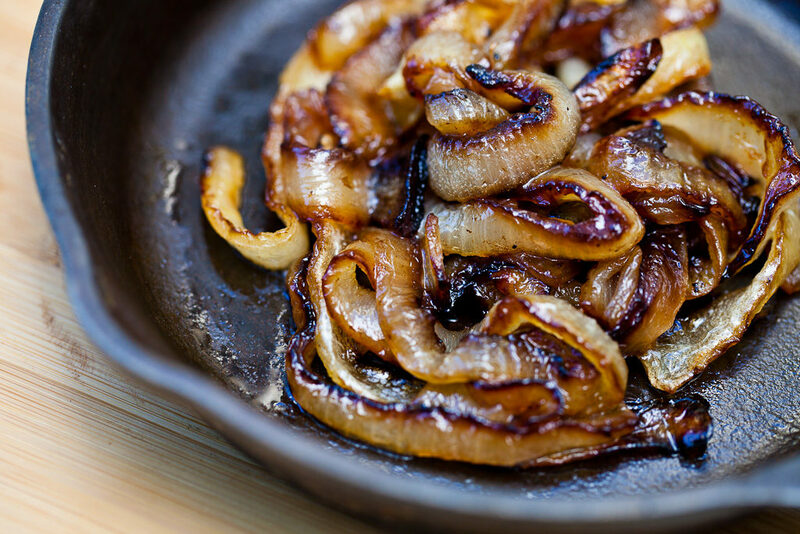 There’s nothing to compare to the long-cooked flavor of onions that have slowly caramelized to bring out their sugars and turned a deep golden brown. But there is another way. I discovered completely by accident at some point that you could achieve a similar flavor in about 40 minutes as what you would otherwise get in two hours. 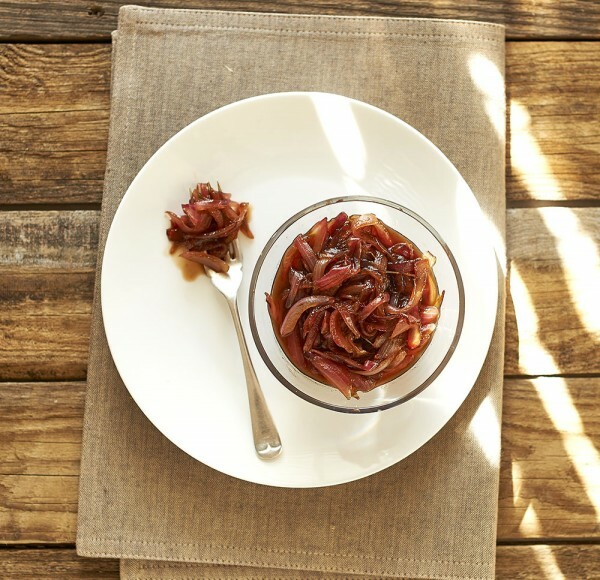 It’s not as deep or as well-balanced but for a dish that uses caramelized onions are only part rather than as the centerpiece flavor, it certainly does the trick. It’s based on the understanding that partly burnt sugar is what gives caramelized onions (or caramel-anything really) it’s deep and rich taste. 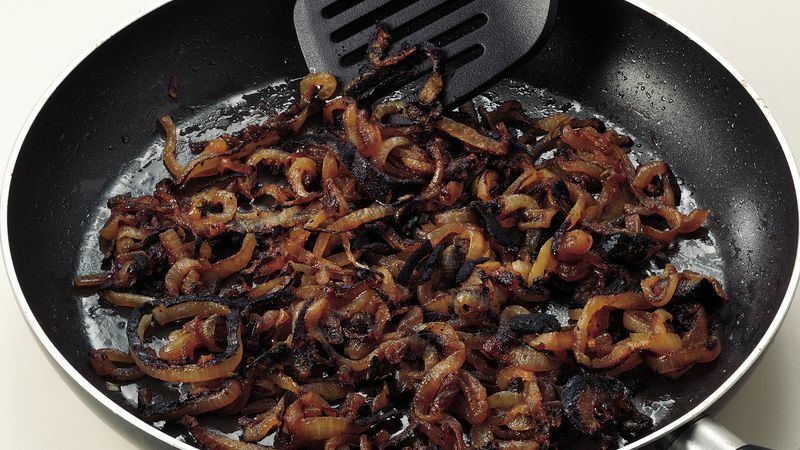 Rather than waiting for the onions to slowly burn to the right point, you can speed up the process, stop it right on the cusp of being char rather than a sweet flavor, and then start it all over again. Most of the caramel sticks to the pan rather than the onions but a bit of a water and a quick scrape of the pan set that right. Is it just as good as the kind that you stir on the stove for hours? Maybe, maybe not, but it’s a whole lot faster which is worth it to me. Step 1. Add the butter to the pan and put over medium heat. Add the onions and salt and cook until the onions start to sweat and look translucent. Step 2. When the onions are soft and have lost some water, about 10 minutes of cooking, turn the heat up slightly, set a timer for 3 minutes and walk away. Check it after the time ends to see if pieces are starting to brown and stick to the bottom. If they aren’t there yet, reset the timer and come back to check. Don’t move the onions too much while this is happening. You want a good crust of brown to form on the bottom of the pan – that will be where the flavor comes from. Step 3. When you start to see golden-brown crust form on the bottom of the pan, pour in ¼ cup of water and SCRAPE. Get up all the brown bits until the pan is clean on the bottom and all the brown-ness has been dissolved in the water. 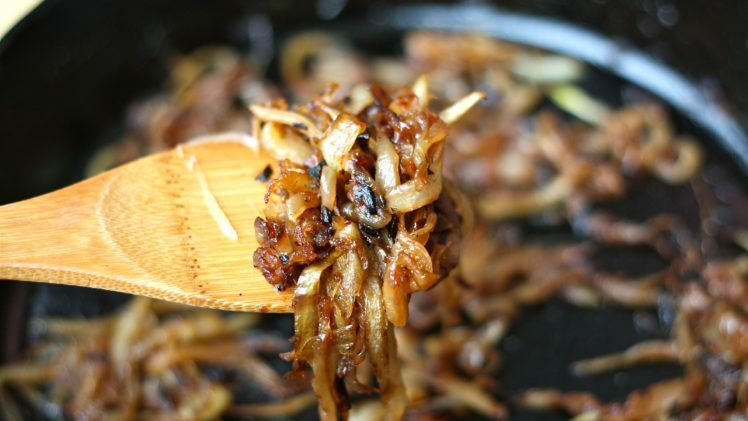 Then gently stir the onions in with the water so that they take on the color and flavor of the caramelization on the pan. Step 4. Repeat steps 2 and 3 at least one more time or more if you like. 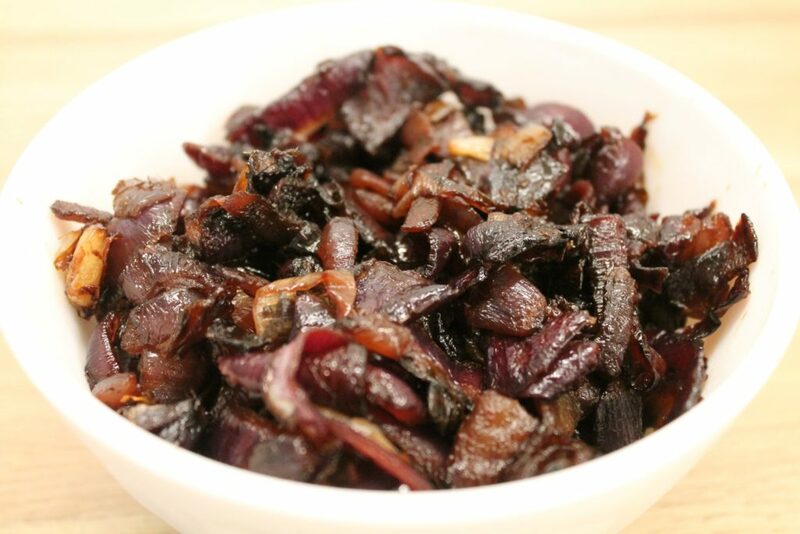 Each time the onions will brown a little more quickly and it will be a little sooner that you need to stop the cooking with cool water before it burns. After four additions of water the onions are nice deep brown and have a deep caramel flavor but more than that and it’s very difficult to keep them from burning. Add this to pretty much any dish you can think of. Stew, soups, casseroles, pizza. Pretty much anywhere you need a flavor boost, this will do it. Dark soy is not the same as regular soy sauce. It’s much thicker and more intense – this is not a place where you can substitute regular soy sauce. It’s only the middle of April but we’re deep into asparagus season around here. For the past month, our weekly CSA box has included a bundle of the elusive green stalks. The first week, I roasted it with just oil and salt and the second week I did the same. But I don’t particularly enjoy repeat meals. Eating the same thing, even for two weeks, is boring to me. So it was time for a change. Last year when this “problem” came up, I pickled it (We can pickle that? Anyone? Just watch the video). This year I went looking for something different. Well, that’s not entirely true. 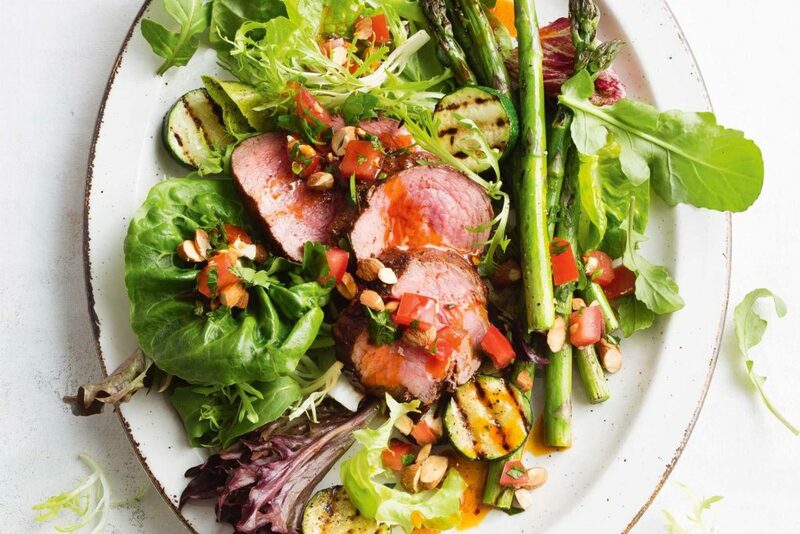 Just when I started thinking that maybe I should consider doing something else with the weekly asparagus bunch, the New York Times posted a whole bunch of asparagus recipes. The picture of asparagus pesto caught my eye and that was that. It could be nothing else. And oh, it was a good choice. Before you ask, no I didn’t actually look any farther than the picture. This isn’t so much an adaptation of the NY Times recipe as much as a dish inspired by the article. Which is fine since when I went back to check the “recipe” is more of a method. Whatever, it’s still delicious. What is it about asparagus that is so lovely? Sometimes I wonder if it would be so popular if it were available year round. Asparagus tastes pretty grassy, very green, which normally means “healthy” and therefore unpopular. But the beginning of the season is always exciting. It becomes a topic of conversation, “Asparagus is back!” By the end of the season I’m usually pretty sick of it and almost glad to see it go. Yes, I feel a little guilty about that, as if I’m supposed to appreciate it more. In a few weeks I’ll probably be pushing it on friends in an effort to get rid of it. 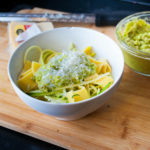 But for now, a bowl of pasta with a vibrantly green asparagus sauce is just what I’m looking for. After all, it is the taste of spring. Inspired by Mark Bittman’s article in The New York Times. 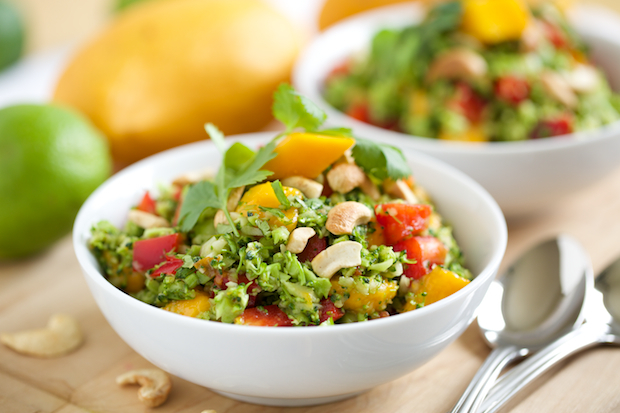 Just like any pesto, this one is customizable to what you like. Less nuts, more cheese, no garlic, add some lemon. 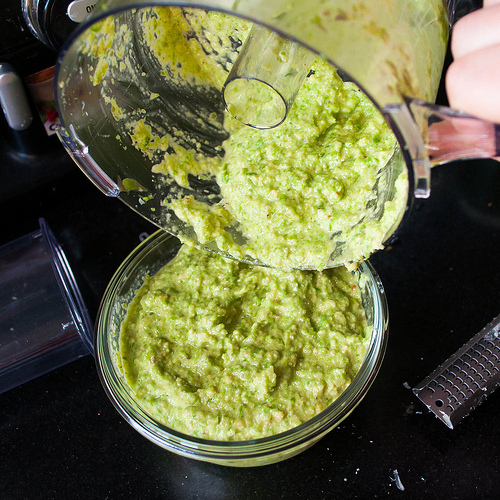 Taste it as you go so that you can make the pesto that you love best. Fill a pot large enough to fit a steamer basket or colander inside (whatever pot you use for steaming vegetables) with about two inches of water and bring it to a boil over medium high heat. Place the asparagus in a steamer or colander and put it over the boiling water so the water doesn’t touch the vegetables. 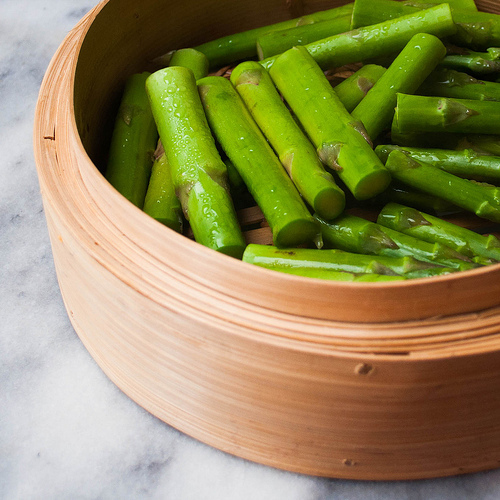 Steam the asparagus for about 10 minutes or until it is dark green and tender. Covering it will speed up the steaming process. 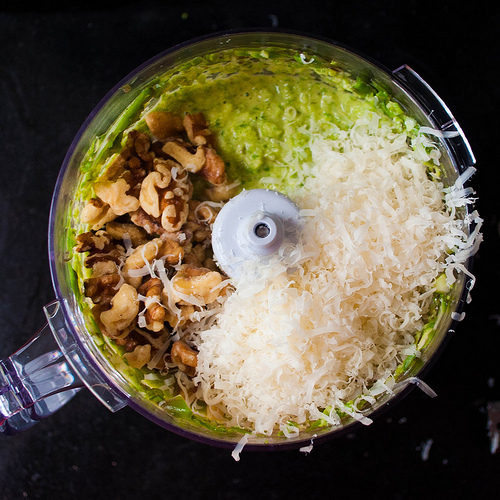 Once the asparagus is steamed add it to a food processor or blender with the oil, cheese, nuts, garlic, salt, and pepper. Blend or process it until smooth. You may need to work in batches if, like me, you only have a mini appliance. 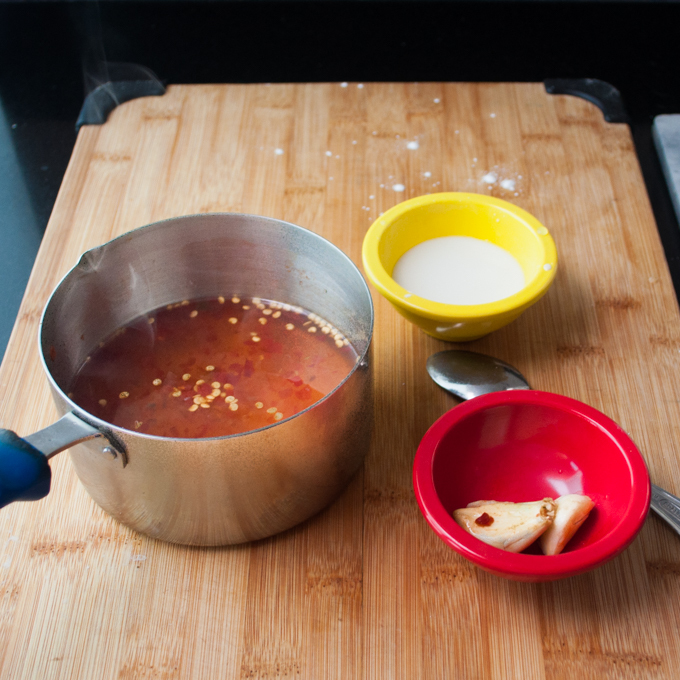 When the sauce is smooth enough for you, taste it and adjust any seasonings as needed. Then serve it immediately over pasta, toast, or grilled meat, or store it in the fridge for up to 10 days. You can eat it cold but I think the flavor is best warm or at room temperature. My original instructions for this say “Blend. Eat.” It’s not really much more complicated than that. I try to clean out my fridge at least once a month, to sort out what’s still edible and unearth the things that got shoved in the back. And every time I go through this process, whether it’s been two weeks or two months since I last took an inventory, there is inevitably a jar of salad dressing, maybe two, hiding behind something. Sometimes it’s one of the vinaigrettes, or the creamy avocado number, and most recently it was Thai dressing. I may, perhaps, be a little obsessed with homemade salad dressing. Back in law school I made a bunch of random homemade things. I had time to do things like make homemade marshmallows on a Tuesday night. Those kinds of things are now relegated to project cooking, things I attempt on weekends with lots of spare time for both the cooking and the cleaning up. The list of homemade staples I make on a regular basis now is pretty short: chicken stock, mayonnaise, and salad dressing. In my defense, homemade salad dressing has a lot going for it. It’s easy to make, it’s significantly cheaper than the store-made equivalent, and most kinds last just about forever in the fridge. 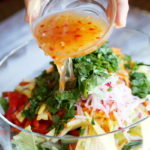 This Thai dressing is fairly time intensive, in terms of salad dressings at least, meaning it takes slightly more than five minutes to put together and requires some chopping. It’s the perfect thing to pour over a bag of pre-shredded slaw, or use as a dipping sauce of chicken wings. 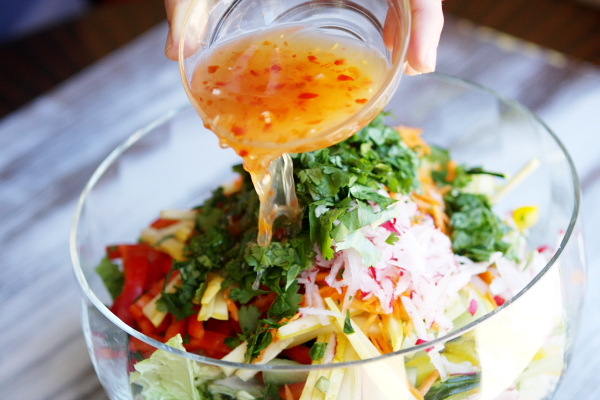 Plus, you can’t make a Thai mango salad without it. It’s fresh and tangy, a little spicy, a little sweet, and I can’t find anything like it in the grocery store. Thai food in ten minutes and four ingredients (or five for a vegetarian version)? I can get behind that even at my laziest. COMBINE all ingredients and stir or shake until the sugar is dissolved. The dressing will last in the fridge for at least two weeks and it tastes better as the flavors mingle. I was a pescetarian while studying abroad in Australia, which was a tricky business. Living on a small campus, and in an area that was largely suburban, there weren’t a lot of non-meat options and the most popular dishes were burgers, steak sandwiches, and meat pies. It wasn’t exactly vegetarian friendly and I ended up eating the same few meals over and over. Some things, like spinach and ricotta filled pastry, I still can’t face. But it was worth it to discover the combination of potato wedges with sweet chili sauce. 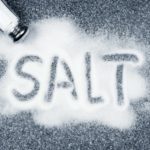 Australians use sweet chili sauce, the Thai condiment, in the way Americans use ketchup, or at least they do when it comes to fries. 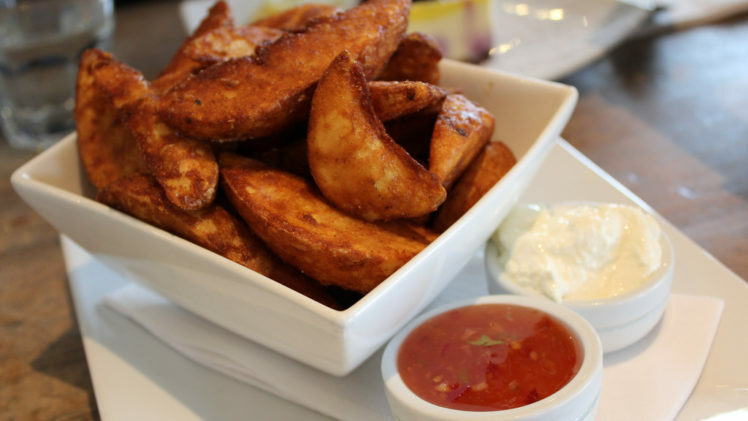 At almost any restaurant I could order thick-cut potato wedges that came with a side of sour cream and sweet chili for dipping. It was cheap and vegetarian and it was heavenly. That, plus the beer, was probably part of the reason I came back from that semester a few pounds heavier. I would absolutely do it again. 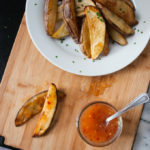 When I got back, I went cold turkey on the wedges and sweet chili, mostly because it was impossible to find potato wedges. Here, we serve our fries in thinner slices which is, well, it’s a problem for me. I may be the only person out there who doesn’t really like crisp and crunchy fries. I like mine just slightly crisp on the outside but still soft enough to bend easily in half. Some might even call it soggy. That preference is why wedges were so amazing to me. The thickly-cut potato wedges are designed to stay soft with just a little crispness on the edges. It’s a beautiful thing and I finally figured out how to do it – without frying that is. Once I learned how to perfect the potato wedge, I had no other choice. I had to tackle the sweet chili sauce. Sure the stuff in the bottle is perfectly acceptable, but the homemade stuff is less sweet, more spicy, and a little tangy. You could cool the heat with a side of sour cream like they do Down Under, but I’ll take these just as they are. Salty, crispy, spicy, sweet. Alright, here’s the secret to baking a potato wedge that has crisp edges: soak the potatoes in water and dry them off before baking and oil the pan, not the potatoes. The water helps wash away some starch and may help steam the potato interior. I honestly don’t know for sure how it works, I just know that it does having tried it with and without this rinse. Oiling the pan helps keep the potatoes from sticking and means they have a small layer of oil to help them brown more quickly, before the inside can get mealy. Preheat the oven to 450F. Wash the potatoes well (or peel them; I prefer my wedges skin-on) and slice them lengthwise in half and then each half into long quarters. Place all the wedges in a bowl and fill the bowl with water so they’re all submerged. Let sit for about five minutes. In the meantime, line a baking sheet with foil and directly the oil and salt directly onto the foil. 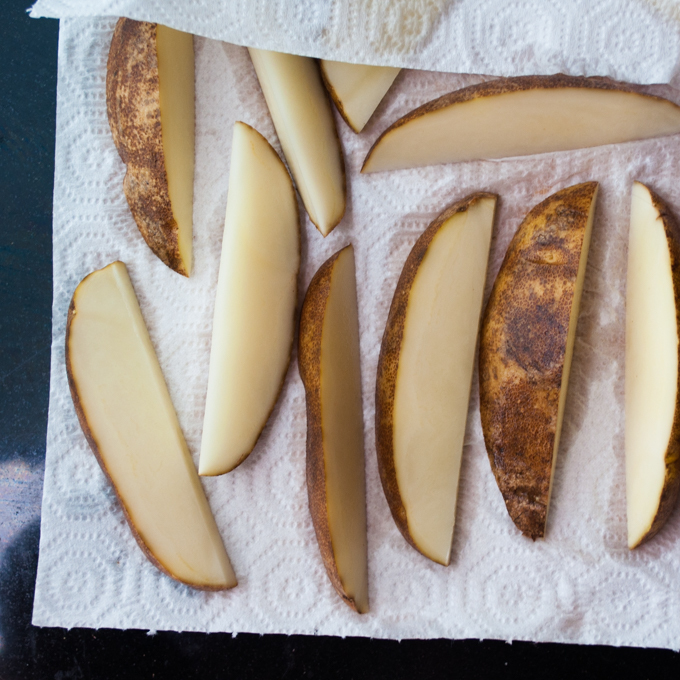 When the potatoes are done, drain them and pat them dry with paper towel to remove any excess moisture. This will make them crispier and help the oil stick to the surface of the potato which adds to the golden brown color. While the wedges are cooking, prepare the sauce. In a small saucepan combine chili paste, vinegar, water, sugar, salt, and garlic. Put the saucepan on the stove on medium high heat and bring it to a boil, stirring to dissolve the sugar. Then turn the heat down as low as possible and let it steep while heated for 20 minutes. After the time is up, fish out the garlic pieces. 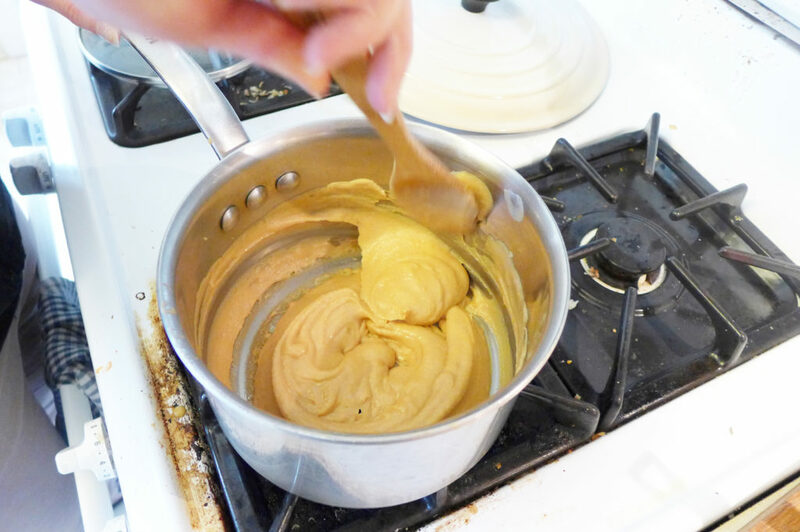 Make a slurry with the cornstarch and water, making sure the cornstarch dissolves fully – no lumps! Stir this into the chili mixture and turn the heat back up to medium high and boil it for a minute or two, until the whiteness of the cornstarch dissolves and the sauce is more of less translucent. Remove it from the heat and let it cool. It should keep in the fridge for up to two weeks and is delicious on everything, from wedges to pizza to frittata. It also make a great salad dressing component with some rice vinegar. You can use fresh chiles here, find two small red ones (pick your poison in terms of heat) and grind them up in a blender with the liquid ingredients, then proceed with the recipe. You can remove the ribs and seeds to decrease the overall heat. But I keep a jar of chili paste in the fridge anyway to spice up meals which means for me, this sauce is made from staples – always a good thing. The oil helps minimize sticking but they may still stick a little. If you peel them off gently you shouldn’t lose any bits on the foil. There comes a time a few days after Thanksgiving where you have to figure out how to repackage your leftovers in a way to make them more appealing. It’s as much a tradition as the Thanksgiving meal itself but one that people don’t talk about nearly as much. Turkey tetrazzini comes to mind as does the ‘tradition’ of letting-leftovers-go-bad-in-the-fridge. But let me suggest an alternative that is much more effective – and delicious. Turkey Shepherd’s Pie. 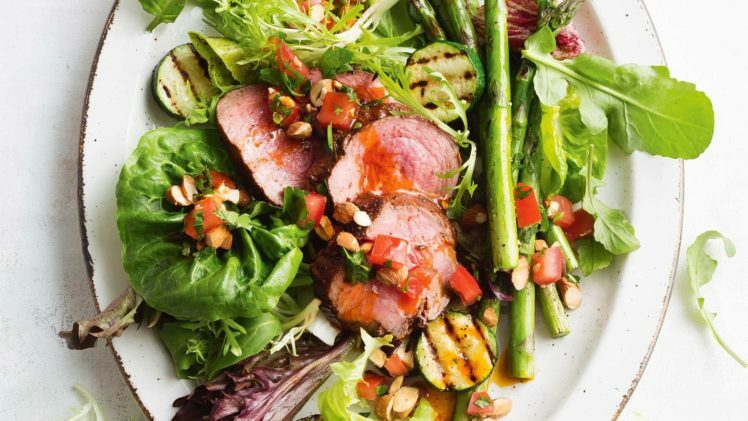 The goal when making a new dish out of leftovers is to use up as many leftovers as possible. It’s not just turkey that needs to be eaten – in fact turkey is often the easiest part to use up. Leftover side dishes get boring after a while and I often have extra celery and carrots from making stuffing that should be used up. Plus there’s the issue of what to do with leftover mashed potatoes which don’t necessarily improve over time. 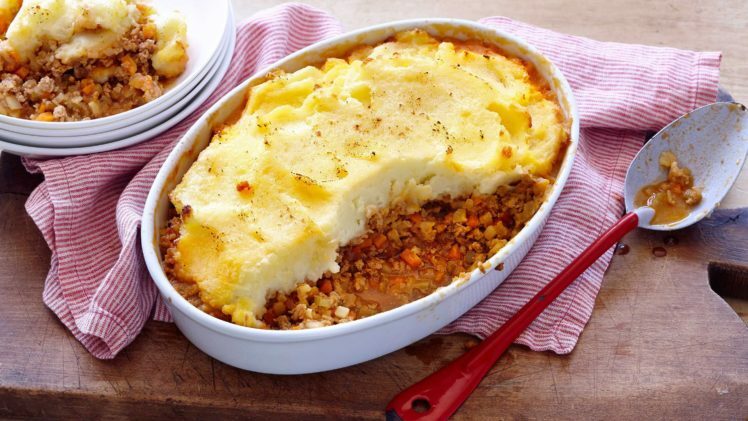 Shepherd’s pie solves all those problems. 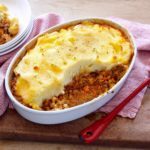 Traditionally Shepherd’s pie is made with ground beef and while it’s called pie it doesn’t normally have a crust on top of bottom – unless you count the mashed potato topping. But pie crust is delicious so I made an extra one during all the Thanksgiving prep work and kept it in the fridge for a few days until I was ready to make pie. The filling is a combination of turkey and side dishes that I was tired of eating on their own and the topping is those otherwise sad mashed potatoes. The end result is crispy on top and it makes the boring leftovers taste new and different again. Turkey tetrazzini still has its place but if you’re looking to use up more than just leftover turkey, this pie may be just what you’re looking for. Preheat the oven to 350F. 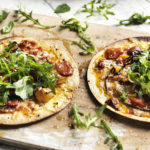 Prepare the filling ingredients by chopping turkey and other slices of leftovers into bite-sized pieces. If you’re using any raw ingredients, stir fry them in a skillet set over medium heat with a tablespoon of oil (or turkey fat) for a few minutes until they’re soft. Combine all the filling ingredients in a bowl and add the gravy and egg. Stir until it’s all evenly combined and set the filling aside. Roll out the pie crust to fit into a deep-dish pie pan or another dish if your pie pan isn’t deep enough to hold all the ingredients. It’s important to have a flat top to spread the mashed potatoes so make sure you won’t have to pile up the ingredients for this pie. A round casserole dish works excellently. When the crust is large enough drape it into the dish and leave the edges hanging over the side. Make sure it touches the bottom before you add the filling – if you stretch the crust it might break when you fill it. Add the filling to the crust and fold the edges in over the top. **Spread the mashed potatoes over the top so all the filling is covered and sprinkle the crunchy bits on top (if using). Bake for 40 minutes or until crust and mashed potatoes are lightly browned. Serve hot or warm, with some leftover cranberry sauce if you have any. We often have a lot of extra gravy so I use it here so it won’t go bad. But if you don’t have enough to spare just add an extra egg to bind the filling together. Leftover mashed potatoes have a tendency to get dry which makes it hard to spread them on the top of the pie. Heat them up in the microwave with some milk and stir the warmed mixture together until they’re soft and relatively smooth. In a normal pie pan there’s usually a lip that the crust can rest on while it bakes so it doesn’t ‘slide down the sides. That doesn’t happen with a casserole dish so folding the edges over the filling helps the crust to not slide down the sides while the pie baked. 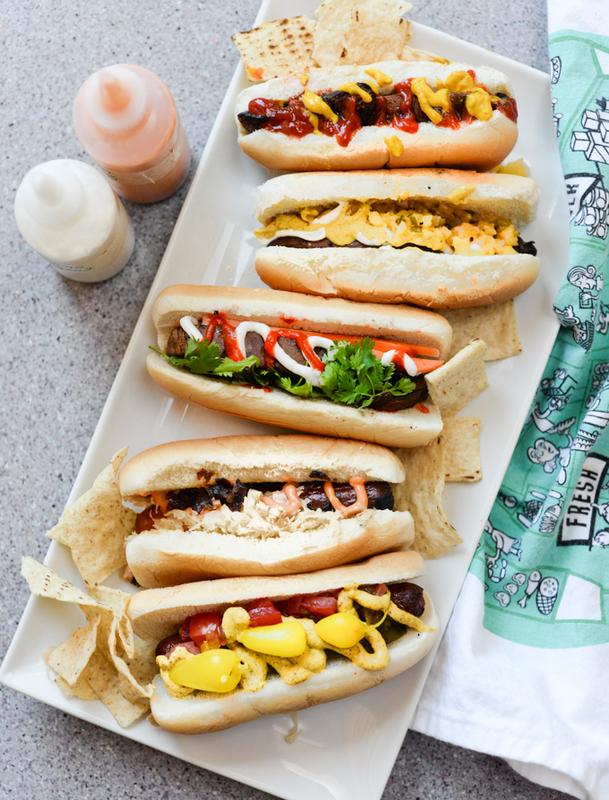 Sometime last year I stumbled across a list of hot dog toppings that are popular in various parts of the world and got the idea to throw a hot dog party. I envisioned a pile of hot dogs and buns, a grill, a park, and a table full of toppings options and I planned it for June since June is the month of birthdays for Jeff and I. But we spent all of last June planning for and throwing two weddings, which left no time or energy to organize another party. So I tucked that plan away and waited until the birthday month swung around again so I could have a hot dog party. What we actually did was throw a kid’s birthday-themed party to celebrate the last year of our 20s, and along with a pinata and a bouncey house, we had hot dog party I’d dreamed up, because hot dogs belong at a kids party. They’re kid food in the nostalgic, everyone-still-likes-to -have-them-sometimes kind of way (instead of the how-did-I-ever-eat-that kind of way). They’re summer food, baseball season food, camping food, the kind of thing that is best when cooked and eaten outside. We set up a picnic birthday in the park and laid a table full of toppings for people to choose from, with a few suggestions of classic combinations. We grilled and ate and played games and whacked a pinata into submission. There were plenty of hot dogs and we grilled up a bunch of veggie dogs as well so that everyone could enjoy the toppings smorgasbord. 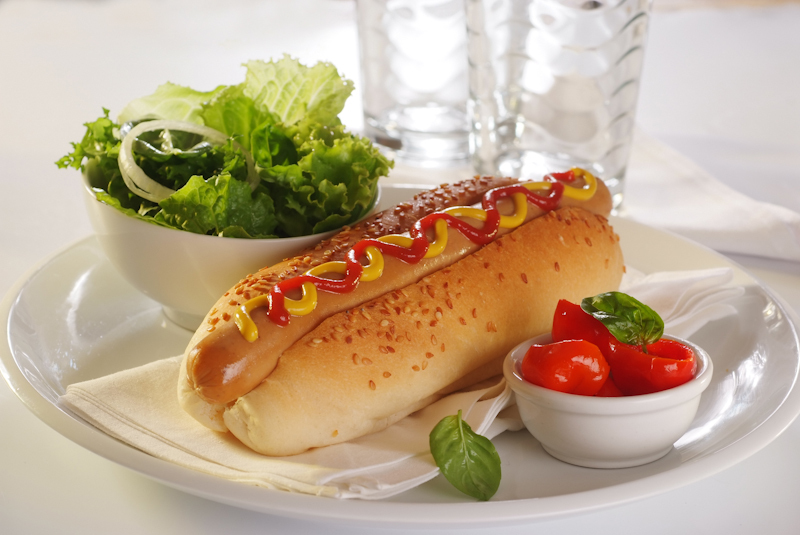 It was perfect for vegetarians and vegans and the people who just don’t like hot dogs as much as vegetables. 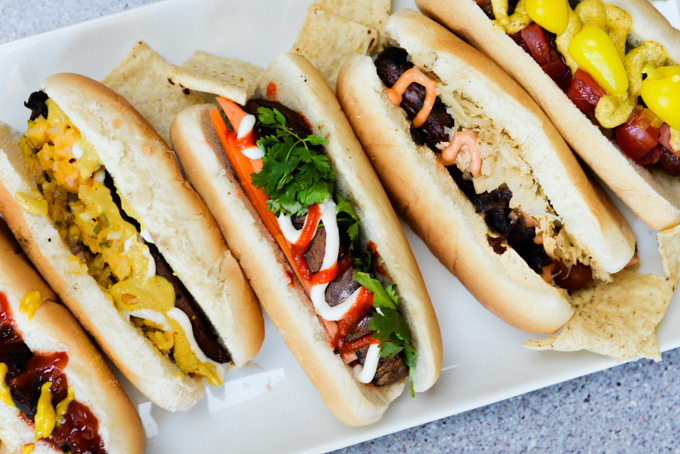 Because these veggie dogs didn’t come from a box, they were made from actual vegetables. Portobello mushrooms to be exact. A large portobello mushroom cap, sliced relatively thickly, marinated in oil and vinegar, and charred on the grill makes a very good approximation of a hot dog. 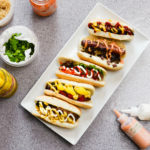 Not that it tastes like a hot dog, but it tastes good and picks up that smoky grill flavor and lets the flavors of the toppings shine through. And this party was all about the toppings. The most genius part of this plan, which I didn’t realize until it happened, is that we didn’t have to spend the whole time tied to the grill. Hot dogs, both regular and mushroom, don’t take long to cook and we didn’t have to juggle the cooking times for a bunch of different things. We grilled in batches, taking breaks to lounge in the grass or join a game of bocce, and when we ran out of dogs it was easy to heat up the grill again and make a few more. Easy. Relaxing. Delicious. We’re taking off to Tahoe for the Fourth of July. My family is visiting and the plan is lake, hot tub, book, repeat. 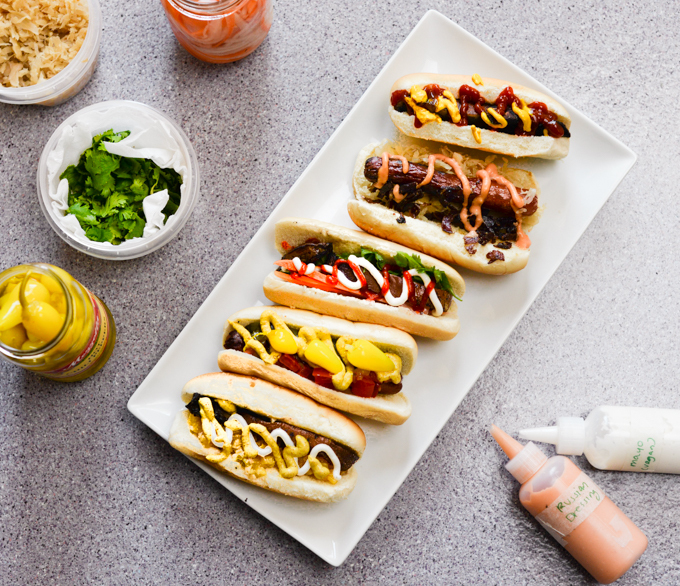 But if you’re having a backyard grilling party, well, hot dogs will probably make an appearance, right? Happy Fourth! As a vegetarian friend eating these said "I never realized that hot dog taste is mostly just the flavor of 'grilled' and sort of savory." TOSS the mushroom strips with oil, salt and pepper and let them sit for a few minutes to marinate while you heat up the grill. PREHEAT the grill to a medium-high heat. You're aiming for something around 400 but it's not an exact science. COOK the mushroom strips for 3-4 minutes a side, about 8 minutes total. If they are getting too brown but don't seem cooked through, move them to a cooler grill spot or turn the heat down. Make sure they're still a bit juicy when they're done and err on undercooking rather than over. They're just mushrooms after all.Like regular hot dogs, these are best grilled-to-order because they're best hot off the grill. And since they take less than 10 minutes to cook, it's easy to throw some on when you need them. 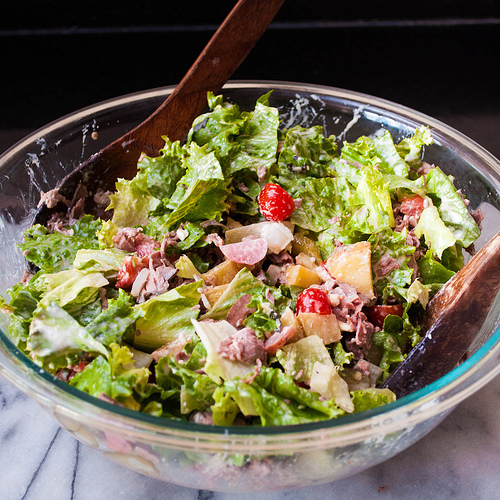 Any leftovers can be tossed over a salad or enjoyed with a dollop of mustard. If you were to take a look around my fridge on any given day you would probably be surprised by the number of condiments that occupy the shelves. There are a few half finished jars of jam, horseradish, chutneys, bits of vinaigrette that haven’t quite been used up yet, and an assortment of odds and ends stuck in the back that I’ve probably forgotten about. And there is also mustard, and several different varieties at that. I’ve even been known to make my own. I at least come by my obsession honestly. My parents’ fridge was always full of various mustards; still is. Last time I visited there was some wasabi mustard and yellow mustard and Dijon, both with and without seeds. There were also a few specialty varieties that my mom had found and which we made sure to put to good use. If you’ve only been using mustard as a small addition to your sandwiches, you’ve been missing out. 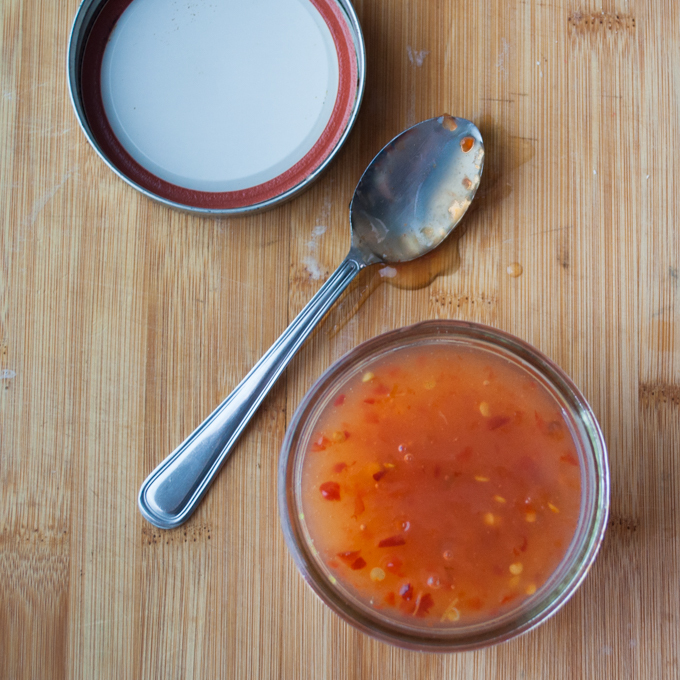 The spicy tang is just the thing to perk up a salad dressing or a stew or a sweet marinade. 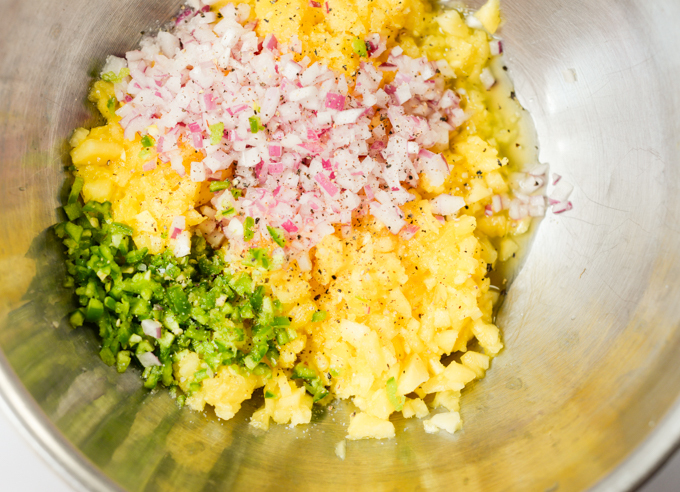 There’s hot and sweet and mild and yellow – yes, yellow mustard is a flavor unto itself. That’s what this dish is really; it’s a celebration of mustard. Chicken is just the vehicle. Because let’s be honest, chicken thighs, especially the boneless and skinless variety, are a little boring. 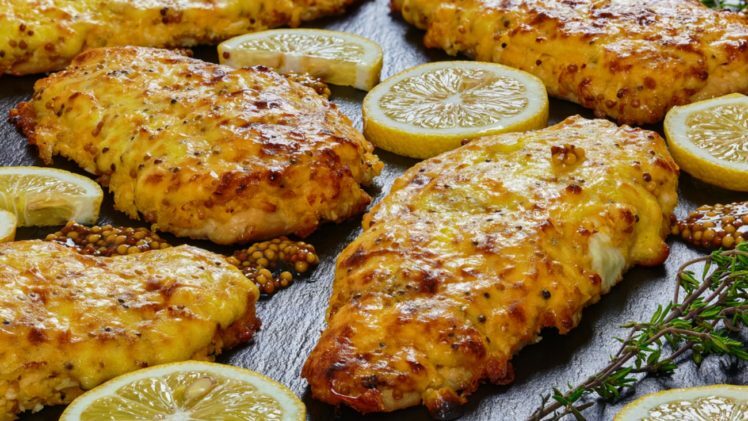 There’s a whole industry devoted to making things – marinades and spice mixes – to perk up your chicken. So let’s do it: some mustard to wake up your tongue and some roasted lemon to keep it sweet. Use your favorite mustard, or a mix of mustards, or that interesting looking one you’ve seen at the store but never known how to use it. Use it here. “Does this have mayo in it?,” was my roommate’s first question and the answer is no although I could see why she thinks so. 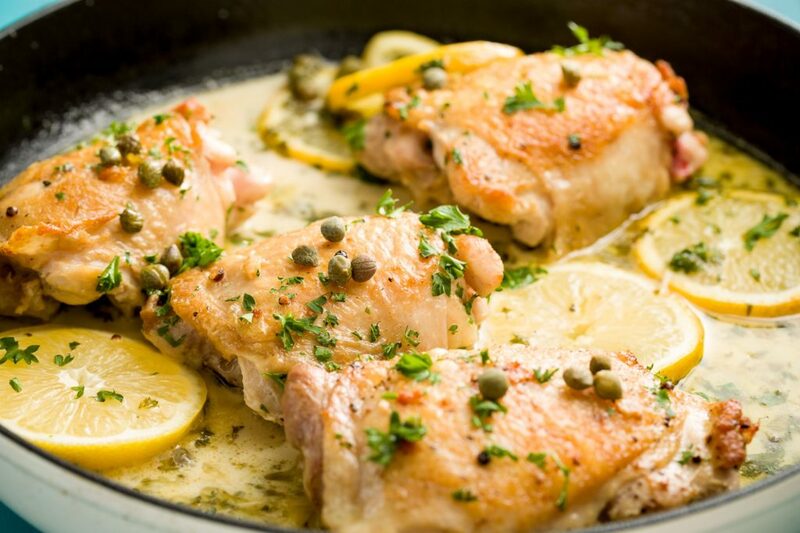 The sauce that results from the chicken, mustard, and lemon is thick and rich and pretty amazing as a gravy. That jar of mustard won’t have to languish at the back of the fridge any more. When you’re ready to bake, preheat the oven to 425F. 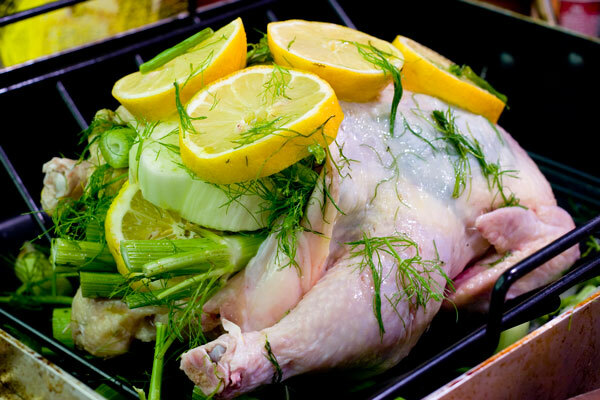 In a large baking dish, about 9 by 13, pour out the chicken and marinade and mix it up with the remaining lemon slices. Make sure the chicken pieces are in a single layer and not on top of one another or they won’t cook evenly. Roast the dish for about 30 minutes until the lemon slices on top are a little browned and the chicken is done. 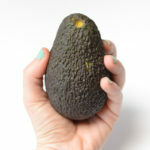 You can test that by cutting into it to check or by taking its temperature – should be about 165. Serve it hot whether that means immediately or after reheating. 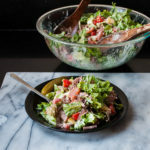 Any leftovers will keep for up to a week and could be made into an amazing chicken salad with just a little bit of extra mayo. *With a wet marinade like this, the chicken skin would never crisp up in the oven and I’m not really a fan of the soft fatty texture you get when the skin doesn’t crisp. Ideally there would be such a thing as bone-in skinless thighs since roasting with the bone adds some extra flavor to the meat, but alas, I haven’t found it. You could of course buy bone-in skin-on chicken thighs and remove the skin yourself but I’m kind of lazy so I just let the mustard make up for any lost flavor. Leeks are really dirty vegetables so I find it easier to chop and then wash them to get out all the dirt. And don’t forget to rinse your cutting board too. 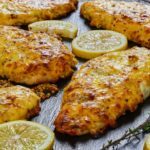 The mustard and lemon will both break down the proteins in the raw chicken a little bit while marinating and at some point it will start to affect the texture of the chicken. That point starts around 8-10 hours so don’t leave it longer than that.